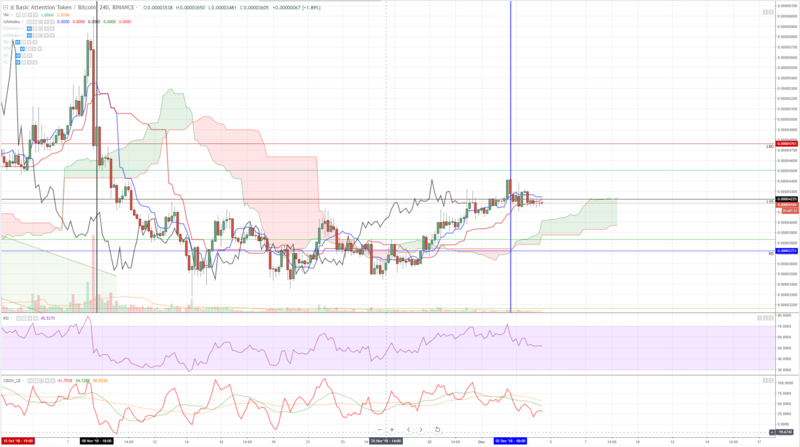 I like the 4-hour Ichimoku charts. For me, they’re a balance between finding a short-term trend change and maintaining a longer frame bias. That is the chart I will be using for today’s analysis. Cardano is showing some weakness after selling below a channel, which was nothing more than a bear flag. The momentum seems to have slowed though, so we could be observing a false break lower. Price is sitting just above the 2018 low of 0.00000906. Both the RSI and the Composite Index are registering signs that a move higher could be in the future due to the near oversold conditions on the RSI and the extreme low condition of the Composite Index. 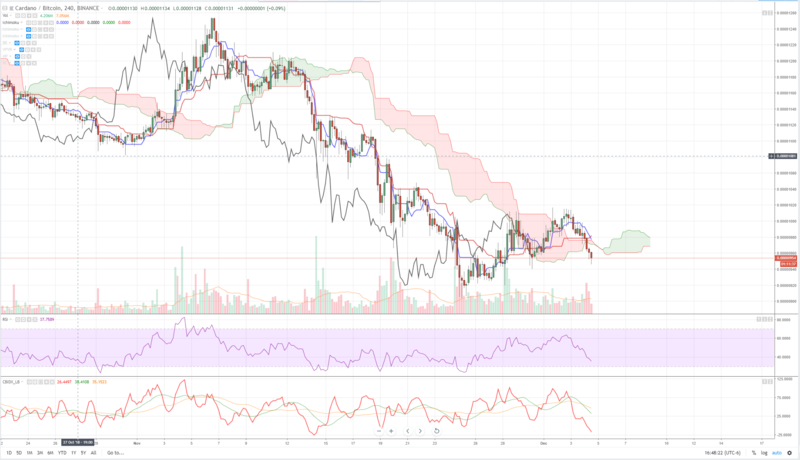 While do see price trading below the cloud, the lagging span remains inside the cloud – if the lagging span finds support on the bottom of the cloud, we could see a move higher. Basic Attention Token is registering some strength. Price and the lagging span are both above the cloud and the conversion line remains above the base line. However, both the conversion line and the base line are in very close proximity to one another and the lagging span is entering the inside of the candlesticks. Price is also just below the base and conversion lines with a series of multiple harami candlestick formations. All of these signs point to a strong probability of congestion and consolidation. There is a square of price and time on the chart with the horizontal level of 0.00003721 intersecting with the beginning of a new Law of Vibration cycle on December 2nd. If price continues to trend higher, then we may very well see the beginning of a new uptrend. Ever since the announcement that Zcash would be listed on Coinbase, it has held and maintained a fairly bullish structure even amid the broader and weaker cryptocurrency market. 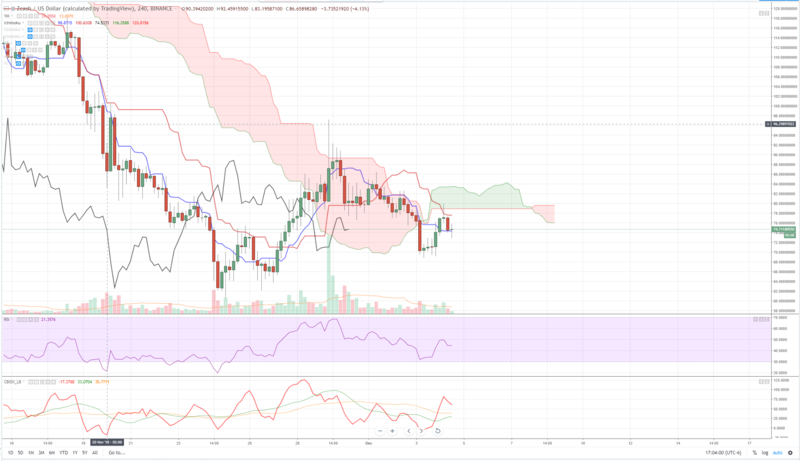 It is currently trading below the 4-hour cloud, but the current candlestick is showing some high probability of a bullish hammer forming – is maintaining a level just above the conversion line. Price is below the cloud and the conversion line is below the base line. The lagging span is inside the cloud and it will be interesting to see what the response will be to price when the lagging span reaches the bottom of the cloud – that could create either a strong support zone or if it falls below, a strong sell signal. It is currently outperforming a number of other cryptocurrencies and when we compare the price action against the other cryptocurrencies that have recently been added to Coinbase, ZEC’s selloff has not been as profound.